The sweatshirt wasn’t the real reason. They just wanted to destroy and steal things and the sweatshirt ad was the newest excuse. The EFF is currently the third-largest party in both houses of the South African parliament. The party has been repeatedly accused of racism against people who are not black. “We [the EFF]are not calling for the slaughter of white people‚ at least for now,” the group’s president, Julius Malema, said during a political rally in 2016. Malema has previously been convicted of hate speech for repeatedly singing “dubul’ ibhunu”, which translates to “shoot the boer [white farmer].” White farmers in South Africa are currently being murdered at a rate that many are deeming to be genocide. The group is confirmed to have targeted stores in Sandton City, Menlyn and Mall of the South — and are believed to be planning to attack more. Following backlash over the image being deemed “racist” the company apologized and removed the image from all of their platforms. They also pulled the sweatshirt from their shelves and have said that they will be recycling them. That wasn’t good enough for socialists however — corrections and apologies are never enough. 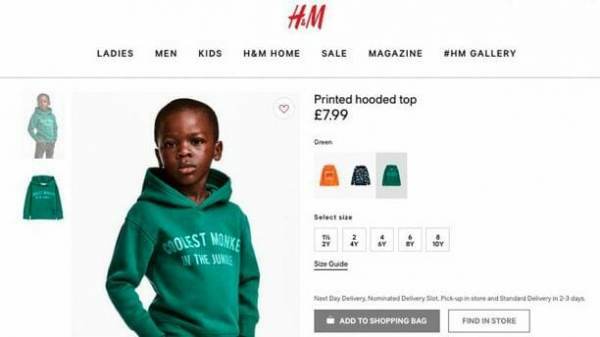 Terry Mango, the mother of the child model has also begged people to stop protesting the stores and “crying wolf.” She was present at the photo shoot and saw no issue with the slogan. “Am the mum and this is one of hundreds of outfits my son has modelled,” Mango wrote. “Stop crying wolf all the time, unnecessary issue here… get over it.” Read more at TGP.